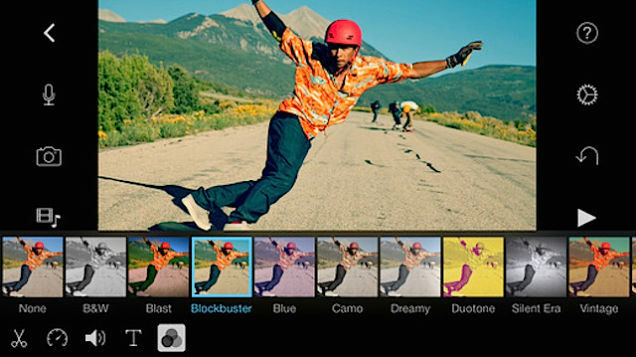 Apple hasn’t changed the camera resolution since the iPhone 4S, but over time, the developers tried to add more features and other improvements to the default camera app. 8MP is a reasonable resolution, but it doesn’t have a great importance, as long as the image quality is very high. The latest iPhone 6 received faster phase-detect autofocus, a new timelapse tool and slo-mo video capture, while the phablet version supports optical image stabilization. If you want to enhance the quality of your photos, you can install a camera application with which you will be able to edit your images, by fixing lens distortion and many more. Below, you’ll find a list of some of the best applications to install on your iPhone 6. This application focuses on the main subject – it can be an item or a person, applying a shallow depth of field effect to it, as if you’re shooting with a DSLR camera, while the overcrowded background will be blurred. You will use your finger to indicate which areas need to be blurred, and if you’re a professional, you can add a nice effect, making the background highlights appear like circles/hexagons. With this application, you will adjust the exposure settings, by manually brightening and darkening the frame, adding granular control for ISO and shutter speed. If you decrease the ISO and lengthen the shutter speed, you will be able to capture a long exposure, but if you want to record fast moving videos, you will need to faster the shutter speed and increase the ISO. Other features that this application will offer are: manual focus, white balance and exposure compensation. Filter effects can transform your images, making them look amazing, and if you don’t consider these effects old-fashioned, then you must install FilterBaker. 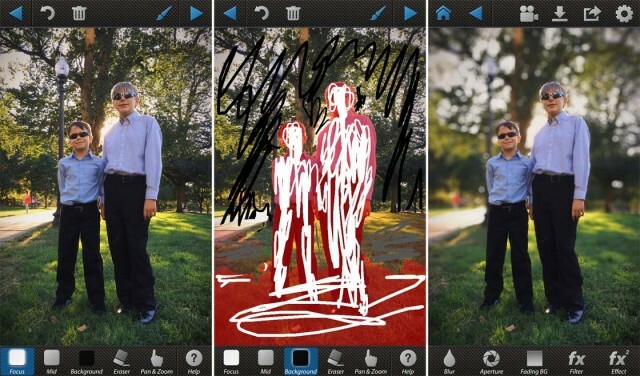 With this application, you won’t be limited to the basic filter options, but you will be able to create your own filter and edit the photos the way you want. You will adjust the sharpness, change the colors and the size of the picture, add shadows, highlights etc. The application has many editing options, allowing you to adjust the saturation, contrast, brightness and add filter effects. Since it was created by Adobe, Photoshop Touch has layers and one of them can be blurred or with a grainy texture, while the other layer can contain an image that will blend into the frame. Moreover, the images that are stored on Adobe’s Creative Cloud can be remotely edited. If an element is unwanted in an image and you don’t know how to remove it, install TouchRetouch and just use your finger to highlight in red the item that you want to be deleted and tap on Start After removing it, the application will fill in the area with pixels from the “vicinity”. You can delete more elements, but the process takes time, because the images need to look perfect! And if you don’t like the result, you can always retry to make modifications to the original photo. Some people who are melancholic, like to post grayscale images on their social media accounts, although others consider them depressive and prefer to post only colorful photos. Anyway, for the first category was created SimplyB&W, an application which will convert the images into black and white. But, this isn’t all this app can do. You will be able to adjust the color levels by brightening the yellows or darkening reds and in addition, you will use the templates to darken or lighten certain colors. Smartphones with a wide-angle lens have a problem with distortion and you’ve probably noticed lines that tend to curve, instead of being straight. SKRWT can fix this problem and you will take accurate pictures of buildings, without worrying that the object will be deformed. If you love watercolor paintings, then Brushstroke will customize your photos so that they will look like they’re manually painted by some artist. And thanks to the variety of brush styles, textured canvases and colored paints, your images will look awesome. In addition, you will have the ability to use settings such as saturation and brightness to tweak your images. Classical films are always pleasant to watch, and there is an application that will add desaturation and color shifting filters, film grain and other effects. VSCO Cam is the best application that offers these filter effects and it’s free to download from the iTunes. It has a simple interface and lots of textures and filters. If can crop or straighten your images, make them look torn or scrappy, and there are many other effects you can use to change your images completely. With this application you will get the best results, but you will need to pay 99 cents on it.